Last week something happened that I had been nervously anticipating for several months. 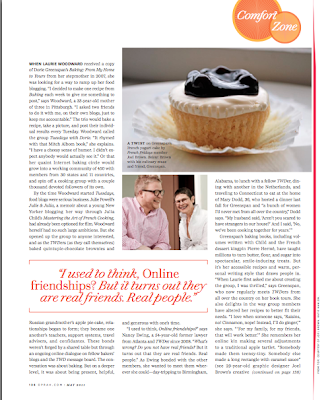 An article came out in "O" (Oprah's magazine) about the communities of bakers and cooks that have formed around Dorie Greenspan's two most recent cookbooks: the Tuesdays With Dorie group baking through every recipe in Baking; From My Home to Yours, and French Fridays With Dorie cooking through her Around My French Table. What happened when the article was published? Pretty much nothing! Our blog names weren't mentioned in the article, so there weren't any additional visitors to my blog. And nobody from my real life - present or past - contacted me to say, "is that you in Oprah this month?" So in the ensuing quiet, I had some time to contemplate the article, which focused on the connections between members of the groups, the communities that we've formed. First of all, I was thrilled that the founder of the two Dorie groups, Laurie of the blog Slush, was in the article's lede. Such fitting tribute to a generous baker, organizer, and blogger! I was interested to see my quote in print. My hour's conversation with the reporter could have yielded any number of quotes, and I can see why he chose that one for the way he wrote the article. And really, although what I said is a bit "state the obvious," I have enjoyed the real life encounters that I've had with virtual baking friends near and far. My baking/blogging buddies certainly don't replace my other, more conventionally-acquired friends. Additionally, I haven't traveled very far solely to meet a fellow blogger (with the exception of a short trip to an adjoining state for lunch with a blogging acquaintance), but in my travels I have had lots of fun connecting with people I otherwise wouldn't have met if not for our online baking and cooking activities. When I recently learned that my husband will be spending substantial portions of time working in a far-away region of the country, one that I've never visited, I immediately contacted a TWD blogger and her positive response made me feel that I already had a friend in that area! Back in November I was able to meet up with fellow TWD and FFwD members and got a chance to meet Dorie herself! I described the meeting in this post, and our gathering of like-kitchens formed the foundation for the article in O - three of the bloggers quoted were all at that meet-up. 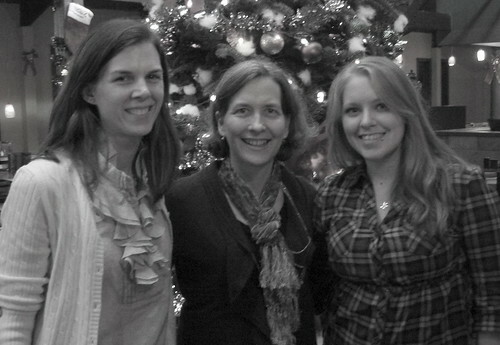 When I was in Houston in December, I managed to meet up with Jessica of The Singleton in the Kitchen (we went to an Alice Medrich cookie-baking demonstration which I wrote about here) and with Jeannette of The Whimsical Cupcake, who just so happens to be this week's hostess for Tuesdays With Dorie (ha! Bet you were wondering when I was going to get around to TWD!) Jessica, Jeannette and I chatted for hours that flew like minutes, and Jeannette's husband was very patient with all of our blog-and-food conversation. 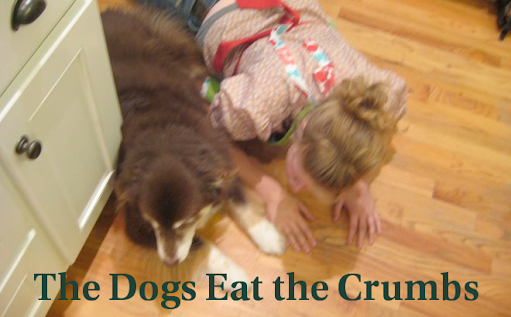 I knew that when it was her turn to choose, Jeannette would pick a fun recipe, and she did. 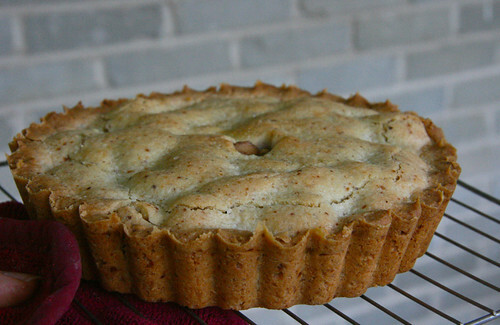 Dorie calls this week's recipe Tourtely Apple Tart, and it's a kind of apple pie where the crust is tart dough and the apple filling is pre-cooked to a near-applesauce consistency. 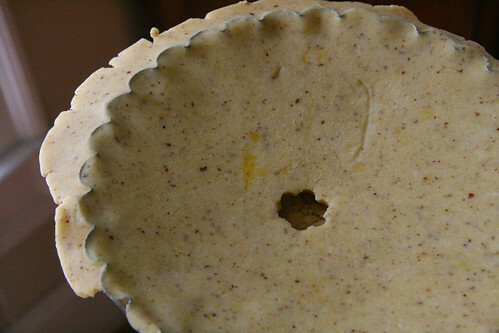 - For the recipe, click over to Jeannette's post about this tourte/tart. There are a few more steps than the average tart or pie. - I made 2/3 recipe of this tart in a 7.5" tart mold. - The apples I used were ones from my farm box orders that have been hanging around in the fruit drawer. They were not particularly tart, so I tried to take steps to boost the intensity of their flavor. 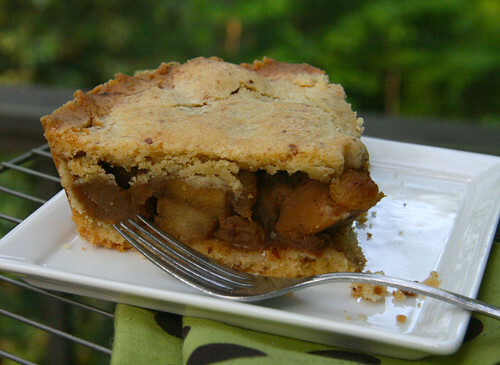 In the filling I substituted boiled cider for the recipe's regular cider, and I used toasted almond meal. Furthermore, I used the optional golden raisins, salt, freshly ground allspice and cinnamon. - The filling is intended to be a type of apple sauce. Mine was more apple than sauce, but apples were well cooked and soft. - I realized - too late - that I'd left out the salt in the tart crust. "Do you like it better than apple pie?" To me, the crust was crying for the forgotten salt. Also, if I'd used tarter apples the tourte might have been a bit more balanced. There's a lot of buttery crust, and a more assertive apple filling would have been better. Congrats Nancy! I know this has been so exciting for you to have such a lovely mention/quotation in a publication like O. Wow, your pretty famous now. Either way, its very gratifying. Relationships are as well. The tort, that was a building project too. I liked it ... but still I like good old fashioned apple pie too. Maybe a bowl of filling and ice cream would do... A very nice post, I enjoyed reading about your adventures. It was such fun to see you all featured...I had goosebumps reading it all! Love your little tart and the way the top crust drapes over your apples...my apples were all too little by the time I cooked them the amount she said to cook them, must have been my apples because there was no draping! Love Jim's quote and it pretty much echoed the guys quotes about it here as well. I don't receive O-Magazine so this is exciting news to hear. I am excited for all of you including Dorie for being featured. I wonder why they wouldn't put the name of your blog in the article, that sounds strange. I made this tart too, gluten free style and the kids both told me they prefer the "regular" apple pie. I thought it was okay. The gluten free crust still needs work, It was too crumbly. I have met few bloogers in real life and hopefully I will meet more when I visit Italy. If you think about it, I think it is pretty amazing to form these connections with people that we would not meet otherwise. I was really, really nervous leading up to the release of this article - mostly because I was sure they were going to post a terribly unflattering photo of me :) I'm glad they didn't! Your tart looks great. I left my apples a little chunky too so it would remind me more of apple pie. Definitely not an apple pie replacement, but a fun variation and definitely a repeat here. yes, when i heard about the article i went straight away to get the magazine. that's so exciting! i did wonder why they didn't mention blog names, though. looks like a great tourte. nice and tall...plenty of room for lots of tasty filling! So exciting to be in Oprah! I loved reading the article. I didn't get to this week's recipe (yet) but it sounds like another great one by all accounts! Your quote is very true, I didn't think that a blogging community could become (to me) what it has. I've made friends that I'm glad I have. I loved the article and your quote...you're famous to all of us, even if not to people in real life. =) This tart sounds quite yummy! Dear Nancy, I read the article online and wasn't surprised at all to find you there ! I agree with you blog friends are real friends and I can't tell you how happy I was to find you nice comment ! Unfortunately I'm quite far from all of you, even if all the roads lead to Rome and I love visiting 'hidden' Rome with foreign friends. I hope to stroll around one day with you ! Make the cream cheese cake it's a simple and 'clean' tasting cake . Sorry I wrote a poem... Buona Pasqua !